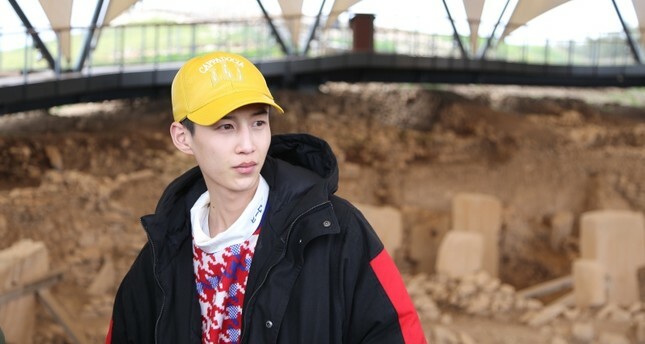 Renowned Chinese singer Xiao Zhang, whose track, "I want to take you to romantic Turkey," has become a popular hit in the country's music scene, has visited the world's oldest temple Göbeklitepe in Turkey's southeastern province of Şanlıurfa. Xiao and his seven-member crew came to Şanlıurfa, supported by Turkish ambassador to Beijing, Abdulkadir Emin Önen. Göbeklitepe Excavation Director and the Şanlıurfa Museum Director Celal Uludağ welcomed the Chinese guests at the site, regarded the "zero point in time" on the UNESCO World Heritage List. Considered the birthplace of human civilizations, Göbeklitepe will define the code of the Turkish tourism policy this year. In a bid to promote one of the most important and ancient archeological sites, the government has declared 2019 as the "Year of Göbeklitepe." The Chinese guests received information from Uludağ about the findings at the site and took pictures with the Turkish flag in Göbeklitepe. Later on, Xiao and his entourage were served the best of Turkish delicacies at the hotel's hall, which was converted from a cave. The Chinese singer also enjoyed local artists performing Şanlıurfa's traditional "Sira Night," a gathering of people eating and singing songs, and then took part in some traditional dance with other guests. Ha later kneaded steak tartar a la Turca and served it to his friends. After accompanying Turkish songs performed by the local musicians, Xiao sang his own track "I want to take you to romantic Turkey," which turned Turkey into a popular destination among Chinese tourists. Speaking to the reporters following the program organized in his honor, Zhang expressed his appreciation to be in the city, saying he was especially impressed by the magnificent history of Göbeklitepe. "There are many interesting human and animal figures at the excavation area. I was quite impressed by Göbeklitepe. I believe beautiful things should be shared and multiplied," he said, adding some of the Turkish dishes did not appeal to their taste of food but that he enjoyed the steak tartar a la Turca. Celal Uludağ, on the other hand, said the guests were fascinated by Göbeklitepe, suggesting he believes they will promote Şanlıurfa in their country. Since China's declaration of 2018 as "Turkey Tourism Year," a great number of Chinese tourists have made their way to Turkey this year. Once the official figures for December are released, Turkey is expected to have close 2018 with over 400,000 Chinese tourists. The government is poised to achieve its target of 1 million Chinese tourists in a short time.